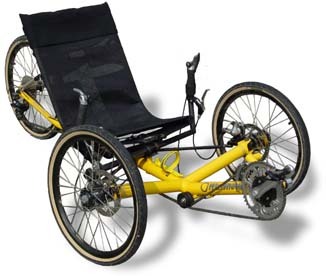 The WizWheelz TerraTrike is an excellent chromoly recumbent built in Hastings, Michigan. The Speed-drive front cranks integrate an internal planetary gearing system for a total of 32 gear combinations. The comfortable seat has two storage pockets for toting tools, food and extra clothing. For more on WizWheelz visit their web site at: www.wizwheelz.com.